It’s pretty impressive to earn the right to play Division I athletics after putting in the work, time and effort it takes to achieve such a task. It’s even more impressive, however, to earn that right after playing the sport for just one year. 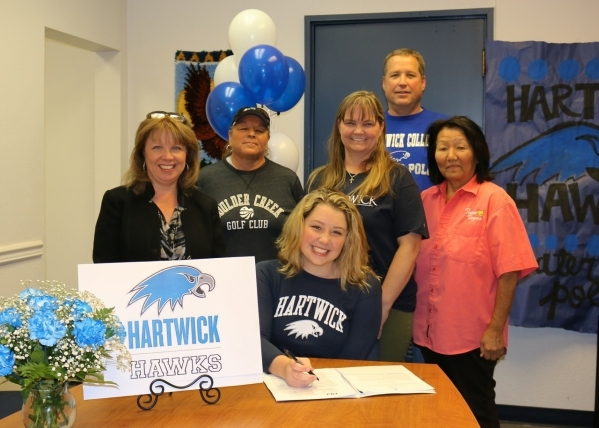 Becca Lelles, who will be playing Division I water polo at Hartwick College in Oneonta, N.Y., next year, signed with the program on Nov. 17 after playing the sport for the first time just over a year ago. Hartwick is in the Collegiate Water Polo Association conference, one of five conferences in Division I women’s water polo. Lelles, whose dream it was to be a collegiate swimmer, had to give up her passion because of a back injury she suffered. Instead of disregarding those aquatic dreams altogether, her then-swimming coach suggested a water polo program that served Southern Nevada youth. Lelles said her decision to sign with Hartwick wasn’t tough to make after having recruiting visits to the upstate New York university. She said the camaraderie and dedication she felt from her future teammates when on campus made her decision fairly simple. The senior also said she didn’t want to be in the same place she grew up, and the idea of going somewhere different was enticing. Lelles is indeed going to play at the next level, but credits all of her accolades and accomplishments to her coach, Sandy Nitta of Team Vegas Water Polo. Most would expect high praise like that to come from their coach, but it’s undeniably much more meaningful coming from Nitta. Nitta was a member of the 1964 USA Olympic swim team and was the USA Senior National coach for 15 years. She’s on several water polo committees and is also a life member of the USA Water Polo Hall of Fame. The Team Vegas head coach said Lelles is as special a player as she’s coached, claiming she’s extremely dedicated, hard-working and focused. “I’m just so proud of her,” she said. Her coach isn’t the only one proud of her, as parents Stuart and Carol Lelles said they couldn’t be happier for their daughter’s future endeavors. “Where a lot of swimmers would’ve quit, it’s amazing that she could pick up on a brand-new sport and set a goal and achieve it — it’s amazing,” Lelles’ mom said. Women’s water polo made its official debut as an Olympic sport at the 2000 Sydney games. It then was adopted at the collegiate level in 2001. Since it’s inception collegiately at the Division I level, only UCLA (7), Stanford (5) and Southern California (3) have won a national championship. Whether Lelles believes it or not, the Boulder City High School product is not only playing for herself, but playing to pave a path for other female youth in Southern Nevada.